One mechanism that directs the action of the second messengers, cAMP and diacylglycerol, is the compartmentalization of protein kinase A (PKA) and protein kinase C (PKC). A-kinase anchoring proteins (AKAPs) can recruit both enzymes to specific subcellular locations via interactions with the various isoforms of each family of kinases. We found previously that a new class of AKAPs, dual-specific AKAPs, denoted D-AKAP1 and D-AKAP2, bind to RIα in addition to the RII subunits. Immunohistochemistry and confocal microscopy were used here to determine that D-AKAP1 colocalizes with RIα at the postsynaptic membrane of the vertebrate neuromuscular junction (NMJ) and the adjacent muscle, but not in the presynaptic region. The labeling pattern for RIα and D-AKAP1 overlapped with mitochondrial staining in the muscle fibers, consistent with our previous work showing D-AKAP1 association with mitochondria in cultured cells. The immunoreactivity of D-AKAP2 was distinct from that of D-AKAP1. We also report here that even though the PKA type II subunits (RIIα and RIIβ) are localized at the NMJ, their patterns are distinctive and differ from the other R and D-AKAP patterns examined. PKCβ appeared to colocalize with the AKAP, gravin, at the postsynaptic membrane. The kinases and AKAPs investigated have distinct patterns of colocalization, which suggest a complex arrangement of signaling micro-environments. Because the labeling patterns for RIα and D-AKAP 1 are similar in the muscle fibers and at the postsynaptic membrane, it may be that this AKAP anchors RIα in these regions. 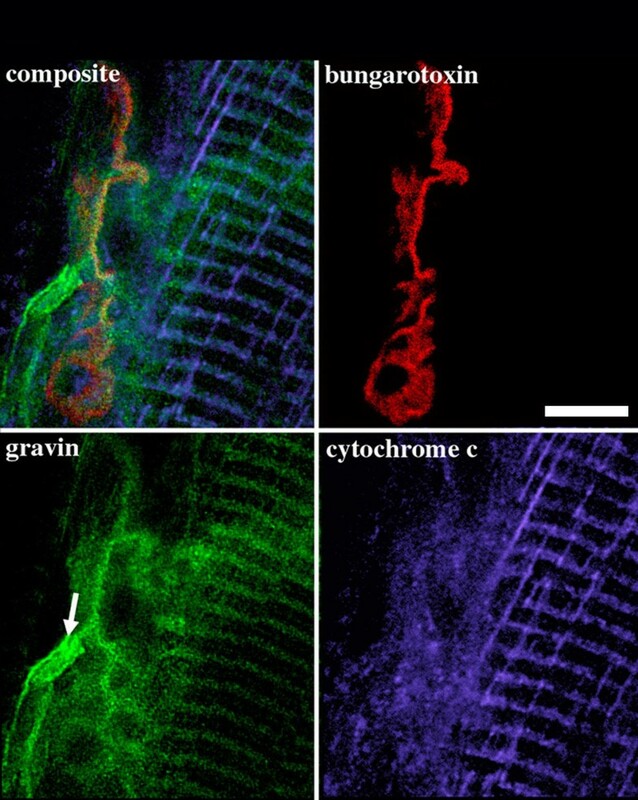 Likewise, gravin may be an anchor of PKCβ at the NMJ. The cell's response to hormones is a dynamic process that requires the efficient transmission of signals from the extracellular environment to specific intracellular sites. For PKA and PKC, the primary signal is generated at the plasma membrane and proceeds through intermediary G-proteins that stimulate adenylyl cyclase  or phospholipases  to generate the second messengers cAMP and diacylglycerol, respectively. The diffusion of these soluble second messengers leads to the activation of PKA and PKC at specific subcellular locations [3, 4]. The two families of the regulatory subunits of PKA, RI and RII, have distinct cAMP binding properties and phosphorylation states [4, 5]. Each family has two different isoforms, a and (3, resulting in four distinct types, RIα, RIβ, RIIα, RIIβ. The different R isoforms have distinct tissue and subcellular distributions suggesting that they may be selectively targeted by scaffold proteins, e.g., AKAPs anchored through different anchoring proteins [6, 7]. PKC has at least 11 isoforms . The physiological role of the individual PKCs has not been elucidated because most cells express multiple isoforms having nearly identical ligand binding properties and substrate specificity. Compartmentation of PKC isoforms has been suggested as a mechanism for targeting selectivity near their physiological substrates [9, 10]. Consistent with this theme of selectivity, work with isoform-specific antibodies demonstrated that PKC isoforms have distinct subcellular locations . It has been known for the past decade that compartmentalization of PKA can occur through association with A-kinase anchoring proteins (AKAPs). This association ensures specificity in signal transduction by placing kinases close to their appropriate substrates where they can swiftly respond to second messengers . Another advantage of compartmentation to specific subcellular locations is to restrict accessibility to certain substrates. Selected AKAPs have been identified that can interact with both PKA and PKC [12, 13]. For example, it was shown that AKAP 79 maintains PKA, PKC, and protein phosphatase 2B at the postsynaptic density of mammalian synapses [14, 12]. Likewise, gravin, a second PKA/PKC anchoring protein, targets these kinases to the membrane cytoskeleton . AKAP79, gravin, and its mouse homolog clone 72 thus belong to the recently identified class of scaffolding proteins that coordinate multiple kinase activity by bringing them to one site. For PKA binding, it was thought for a long time that only RII subunits bind to AKAPs. However, a new class of AKAPs was discovered when two dual-specific AKAPs (D-AKAP1 and D-AKAP2) were cloned using a fusion protein of the RIα as the bait in a yeast two-hybrid screen [15, 16]). Therefore, the contrasted distribution pattern between RI and RII may in part be due to selective association with different compartmentalized pools of AKAPs. Only recently has the subcellular distribution of PKA at neuromuscular junctions (NMJs) and the adjacent muscle been systematically studied [17, 18]. Imaizumi-Scherrer and colleagues demonstrated that RIα is localized at the NMJ , but whether RI associates with a D-AKAP in this region of muscle is not known. However, a recent study showing the colocalization of D-AKAP1 with RI at the NMJ supports the prediction that localization of the R subunit there requires interaction with an AKAP . 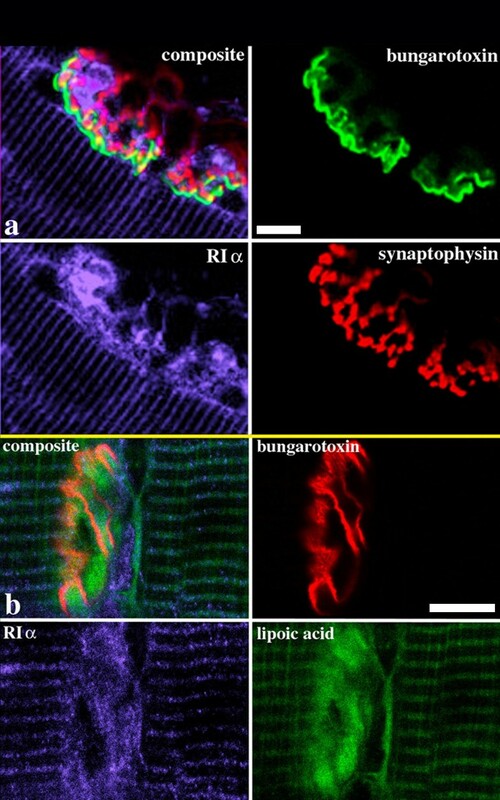 RII has been shown to be associated with mAKAP in heart and skeletal muscle [20, 21]; however, little is known regarding the expression patterns of RII and AKAPs in the perijunctional regions. More information has accumulated concerning PKC expression associated with the NMJ and skeletal muscle. PKCβ was shown to localize to the presynaptic terminals of NMJs [22, 23], whereas PKCθ plays a postsynaptic role at the NMJ . In skeletal muscle, PKCα was found in human muscle fibers  and with T-tubules in rabbit skeletal muscle . However, it is unknown whether tethering to a PKC-anchoring protein mediates the localization to these compartments. The work reported here was undertaken to further understand the compartmentalization of PKA and PKC through association with AKAPs. Because RIα was observed in close association with the NMJ postsynaptic membrane , we probed for D-AKAP expression and possible colocalization with this and other regulatory subunits. We also investigated the distribution of gravin at the NMJ because this AKAP is an autoantigen for myasthenia gravis, a degenerative disease of the NMJ. Western blot assays confirmed that the antibodies used are monospecific (fig. 1). The blots show that PKCα, the major PKC isoform present in muscle, is not detected by the PKCβII antibody, and that there is little overlap between the specificities of the PKA regulatory subunit antibodies. As with a previous report studying different groups of skeletal muscle , the soluble fraction contained most of the RIα. A band for RIIβ was detected in contrast to a report of no RIIβ detection in soleus or extensor digitorum longus muscles , which might be explained by the presence of nerve fibers or adipocytes wherein RIIβ is prevalent . The blot for the affinity-purified D-AKAP1 antibody is shown because the protein-A purified antibody displayed additional, unexplained bands; however, no difference in fluorescence labeling was observed when using antibodies purified either way. Western blot showing specificity of antibodies used for immunofluorescence. A. Gravin was detected using affinity-purified antibodies raised against residues 1130–1780 of the recombinant protein. HeLa cell lysates were incubated with 15 μg of anti-gravin (Lysate) or 15 μg of preimmune IgG (Pre). 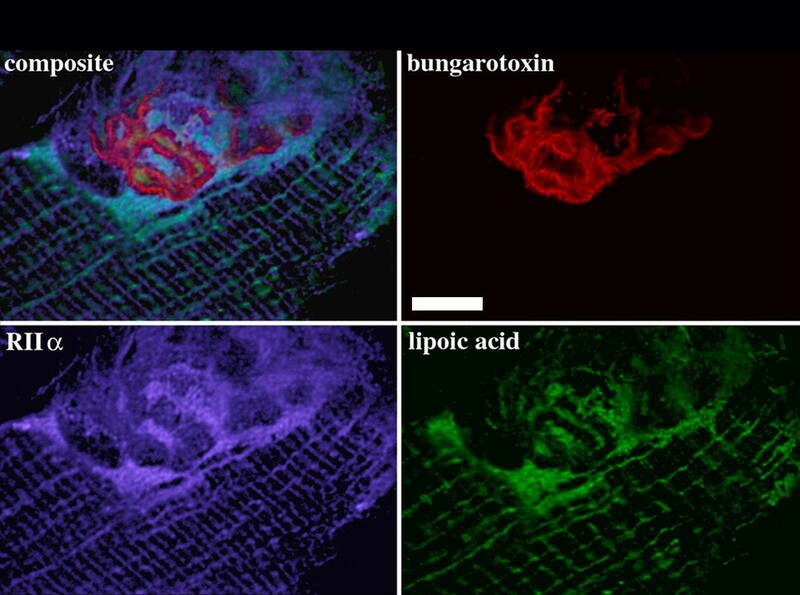 B. and C. Triton X-100 soluble supernatant (Sup) and insoluble pellet (Pel) of rat intercostal muscle homogenate were subjected to polyacrylamide gel electrophoresis, transferred to membrane, and immunoblotted to detect the protein of interest. Molecular weight markers are shown with arrowheads. 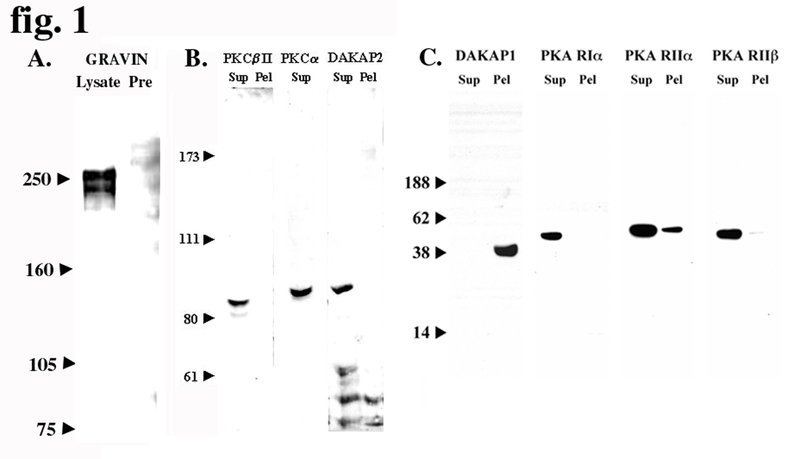 Of particular importance are the blots showing that PKC α the major PKC isoform present in muscle, is not detected with the PKC βII antibody, and that there is little overlap between the specificities of the PKA regulatory domain antibodies. A previous report using immunofluorescence demonstrated colocalization of RIα with the nicotinic acetylcholine receptor (nAChR) at the NMJ postsynaptic membrane . We used immunohistochemistry coupled with confocal microscopy to acquire detailed information as to the intracellular localization of D-AKAP1 in the several regions of the NMJ and adjacent intercostal muscle to compare with that of RIα. Rhodamine-conjugated α-bungarotoxin was used to delineate the postsynaptic membrane of the NMJ because it binds tightly to the nAChR found at this membrane. Because D-AKAP1 was shown to associate with mitochondria , double-labeling with markers for this organelle, either anti-lipoic acid or anti-cytochrome c, was used to examine whether RIα or D-AKAP1 are associated with mitochondria in the NMJ. We found partial overlap of the RIα label with synaptophysin, which labels presynaptic vesicles (fig. 2a). Importantly, RIα was observed to be concentrated in other vicinities of the presynapse as well. In the postsynaptic region, RIα immunoreactivity showed partial overlap with the mitochondrial marker (lipoic acid); overlap with mitochondria in muscle fibers was also observed (fig. 2b). In muscle, labeling of the I-band by anti RIα was dominant. The I-band contains actin and is where mitochondria are located, but has no myosin. RIα labeling of the NMJ and adjacent muscle. Individual optical sections from separate z-series were chosen after deblurring that most completely shows the postsynaptic membrane topography in order to demarcate presynaptic from postsynaptic regions. (a) Partial overlap occurs between RIα and synaptophysin, which labels presynaptic vesicles. Overlap is also seen with bungarotoxin, although it is not prominent, scale bar = 10 μm. (b) RIα overlaps the mitochondrial marker in the postsynaptic region, as well as mitochondria in the actin region of muscle fibers. Motor endplates were identified by labeling the nAChR using rhodamine-conjugated α-bungarotoxin. Anti-lipoic acid marks mitochondria only. scale bar = 10 μm. The distribution of D-AKAP1 at the postsynaptic NMJ and the adjacent muscle is similar to that of RIα, although there is no codistribution at the presynaptic region between these two labels (fig. 3a). D-AKAP1 is expressed in both NMJ and intercostal muscle. D-AKAP1 codistribution with cytochrome c (mitochondrial marker) is significant (fig. 3a), but not as pronounced as the RIIα association with mitochondria (compare with fig. 5). We observed an enrichment of D-AKAP1 at the postsynaptic membrane, as shown by codistribution with nAChR (fig. 3b). As with RIα, labeling of the actin region by anti-D-AKAP1 was dominant (fig. 3a, 3c). Because the labeling patterns for RIα and D-AKAP1 appear similar in the muscle fibers and at the postsynaptic membrane, D-AKAP1 may anchor RIα in these regions, which further supports the cloning and biochemical evidence of interaction between these proteins [15, 28]. Phalloidin was used as a positive control for the actin region of muscle fibers (fig. 3c). The no-primary control was clean (fig. 3d). Because the antibodies to D-AKAP1 and RIα were produced in rabbit and mouse, respectively, double-labeling confocal experiments could be performed with these antibodies on the same tissue slice in order to test for colocalization. The same applies for anti-RIIα and anti-RIIβ. We found that the labeling patterns for these two antibodies in muscle tissue counterstained with bungarotoxin and anti-D-AKAP1 (data not shown) was not modified from that found when counterstained with bungarotoxin and a mitochondrial marker (see below), indicating partial colocalization of D-AKAP1 with RIIα but, little if any overlap with RIIβ. 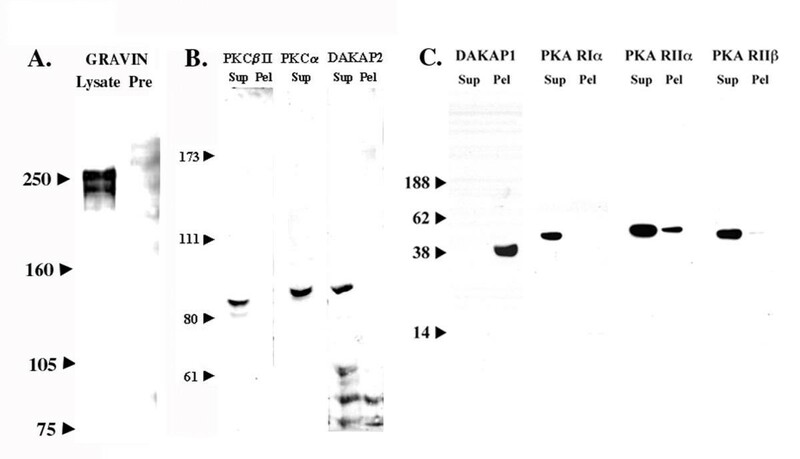 In contrast, the RIα labeling was invariably almost completely abolished when counterstained with bungarotoxin and anti-D-AKAP1 in multiple experiments (data not shown). This suggests to us that anti-D-AKAP1 may be occluding RIα bound to D-AKAP1 to the extent that anti-RIα has little access to its antigen. 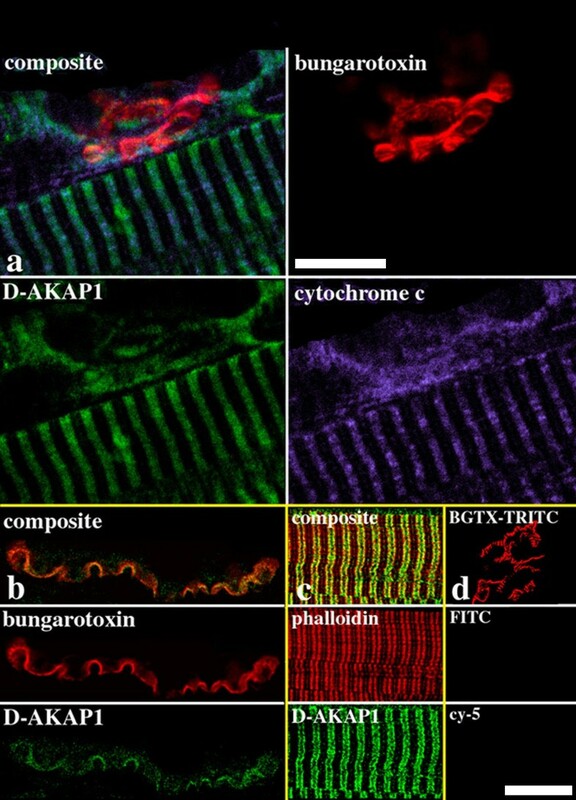 Confocal microscope images of D-AKAP1 labeled NMJ in adult rat intercostal muscle. Anti-cytochrome c marks mitochondria and bungarotoxin labels the nAChR. (a) Distribution of D-AKAP1 at the NMJ and adjacent muscle. D-AKAP1 codistributes with cytochrome c in the actin region of the intercostal muscle and the postsynaptic region of the NMJ. (b) D-AKAP1 is enriched at the postsynaptic membrane, as shown by codistribution with nAChR. scale bar = 10 μm for both (a) and (b). (c) Double-labeling of phalloidin, which binds to F-actin, and D-AKAP1. Phalloidin demarcates the actin region and is used as a positive control for this region,(d) No primary control. Fluorophore-conjugated secondary antibodies show that very low background from nonspecific labeling comes from these antibodies. Bungarotoxin-TRITC was used to find the NMJs in the negative controls, scale bar = 10 μm for both (c) and (d). 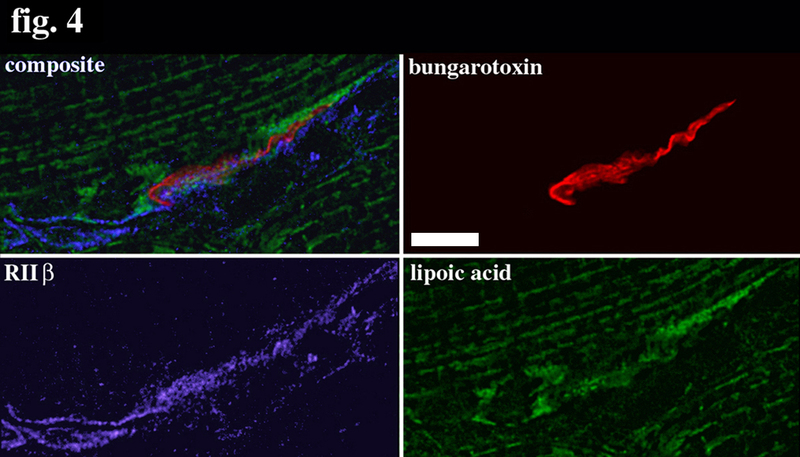 Confocal images of immunofluorescent staining in and around an NMJ showing RIIβ, lipoic acid, and bungarotoxin patterns separately and in composite overlay. An individual section from a deblurred z-series shows RIIβ immunoreactivity only in the postsynaptic region having little overlap with the mitochondrial marker, scale bar = 10 μm. 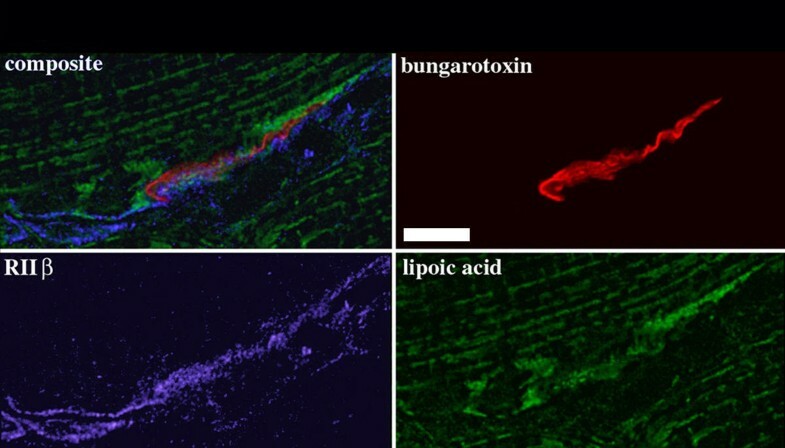 Triple-labeling immunofluorescent staining patterns show RIIα, lipoic acid, and bungarotoxin separately and in composite overlay. RIIα immunoreactivity overlapped significantly with mitochondria, present along I-bands and in striations perpendicular to these bands. Within the muscle fibers, RIIα is seen to label the z-line, an area that phalloidin also labels (see fig. 1), in addition to the I-band. scale bar = 10 μm. As shown in figure 4, RIIβ is found in the postsynaptic region of the NMJ and did not precisely overlap with the α-bungarotoxin label but instead encompassed a broader area of this region. RIIβ immunoreactivity appeared to be punctate in the cytosol, yet contrasted with the punctate distribution of mitochondria. The presence of labeling at the NMJ is consistent with the prevalence of RII in neuronal tissue . The lack of staining in the muscle fibers is in agreement with the report that RIIβ did not show significant hybridization with skeletal muscle . 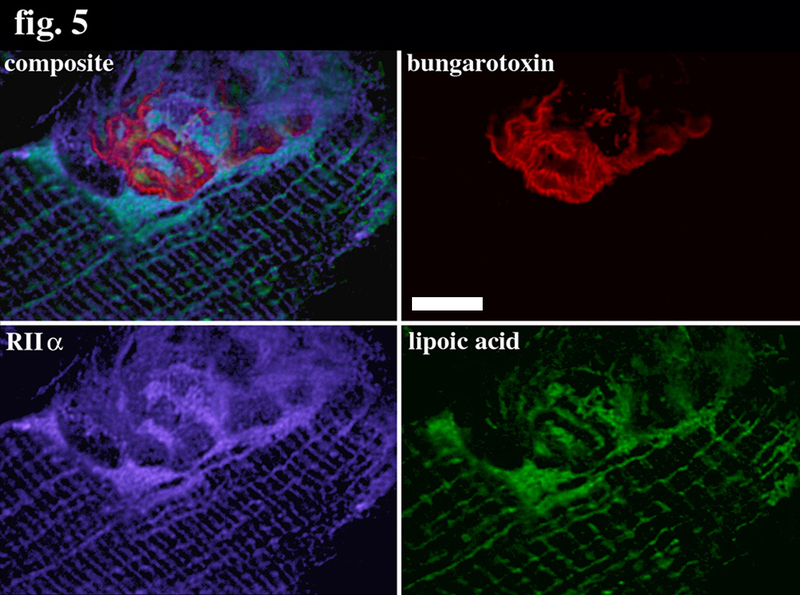 Triple-labeling immunofluorescent staining patterns (fig. 5) suggests that RIIα is concentrated in the postsynaptic vicinity of the NMJ but is not colocalized with the nAChR. RIIα immunoreactivity exhibited significant overlap with mitochondria in the postsynaptic region of the NMJ and with mitochondria in skeletal muscle fibers. Labeling of the I-band was dominant. Interestingly, intense immunoreactivity was found to be consistently localized with the z-line. Of the 7 kinase and AKAP labeling patterns shown in this paper, RIIα is the only one that strongly associates with the z-line (contrast with the phalloidin labeling shown in fig. 2c). The labeling pattern of D-AKAP2 (fig. 6) differs from that of D-AKAP1. Even though the striated labeling in the muscle fibers appears similar to the striations noted for D-AKAP1 and RIα and is where actin is prevalent, the overlap with the mitochondrial marker (cytochrome c) is poor, in contrast with observations of close overlap in cells . In the NMJ, the D-AKAP2 pattern is rather diffuse, being present in both postsynaptic and presynaptic vicinities, and appears dissimilar to the mitochondrial pattern. Distribution of D-AKAP2 at the NMJ and adjacent muscle. D-AKAP2 labeling is diffuse in both pre-and postsynaptic regions of the NMJ. In muscle, D-AKAP2 labeling is in the actin region, but does not colocalize well with mitochondria. Indeed, the strongest labeling is perpendicular to the mitochondrial striations. scale bar = 10 μm. Intense PKCβ immunoreactivity was found in both postsynaptic and presynaptic regions (fig. 7), consistent with enhanced PKCα and PKCθ labeling in the NMJ . Over a background of more diffuse staining, two stronger bands can be observed. One band codistributes with nAChR. The other band is in the presynaptic region and parallels the nAChR band. In addition to these bands, there is strong immunoreactivity in other areas of the presynapse. The labeling pattern of PKCβ is sufficiently different from that of the mitochondrial label to indicate that there is no association with this organelle in either the NMJ or muscle fibers. PKCβ labeling in the muscle fibers is faint, which corroborates the report that PKCα and PKCθ are the predominant PKC isoforms in skeletal muscle , with PKCθ being more abundant in the membrane fraction of muscle and PKCα being more abundant in the cytosolic fraction. PKCβ labeling of the NMJ. Over a background of more diffuse staining, two stronger bands are seen (double arrows). One band codistributes with nAChR. The other band, found in the presynaptic region, parallels the nAChR band and may be labeling the presynaptic membrane. In addition to these bands, there are strong pockets of immunoreactivity in other areas of the presynapse (arrowheads). There appears to be no association of PKCβ with the mitochondrial label. PKCβ labeling in the muscle fibers is faint, scale bar = 10 μm. As with PKCβ, gravin codistributes with nAChR (fig. 8). Immunoreactivity is predominantly in the postsynaptic region and doesn't overlap particularly well with the mitochondrial marker. The strongest labeling is at the plasma membrane. This labeling is consistent with the report that gravin possesses several targeting motifs that direct it to the membrane-cytoskeleton . In the muscle fibers, striations of staining are noticeable. Even though there is partial overlap of these striations with those typical of mitochondria (labeled with cytochrome c), the staining occurs where actin is prevalent. Because gravin has a putative actin-binding domain, it is likely that the association is with actin. Tables 1 and 2 summarize the compartmental localization and mitochondrial association in the NMJ and intercostal muscle of the several AKAPs and kinases studied based on the immunofluorescence work reported here. Gravin labeling of the NMJ and intercostal muscle. Labeling is strongest at the plasma membrane-cytoskeleton (arrow). Codistribution is also found with nAChR at the postsynaptic membrane. Labeling in the muscle is in the actin-rich region, scale bar = 10 μm. The work presented here adds to the emerging evidence that PKA and PKC signaling at the NMJ and adjacent intercostal muscle is compartmentalized. Differential compartmentation of these signaling molecules in cells and tissues is being recognized as a mechanism to regulate their specificity [reviewed recently by ]. A Kinase Anchoring Proteins (AKAPs) can direct their subcellular localization by binding directly to regulatory subunits of PKA or to the catalytic core of PKC. Many AKAPs have been identified, although information about their subcellular distribution in different tissues is largely lacking. Because we produced antibodies to two novel dual-specific AKAPs (D-AKAP1 and D-AKAP2), and gravin, we were uniquely positioned to use immunofluorescence to investigate their possible roles in kinase signaling in and around the NMJ. Our interest in PKA and PKC activity in the NMJ derives from: (1) a report that RIα not only is enriched there, but also appears to be tethered to the postsynaptic membrane , (2) the rich literature describing selective PKC isoform activity and functional compartmentalization in the NMJ and skeletal muscle, (3) our discoveries that D-AKAP1 and D-AKAP2 bind to and appear to colocalize with RIα, and often mitochondria [15, 16, 28]; and (4) our finding that gravin binds to both PKA and PKC . We found that D-AKAP1 appears to colocalize with RIα at the postsynaptic membrane of the NMJ, which houses the nAChR, but not in the presynaptic region. This observation is supported by previous work that demonstrated RIα codistribution with nAChR  and D-AKAP1  suggesting that this AKAP is the anchoring protein recruiting RIα to this membrane. This putative association is strengthened by finding for the first time that targeting of RIα requires the AKAP binding surface . Yotiao is another AKAP enriched at the NMJ, but appears to bind only RII . PKA phosphorylates the nAChR when stimulated at the synapse by the neuropeptide CGRP and by adenosine from muscle responding to acetylcholine [reviewed by ]. This phosphorylation may regulate the degradation of the nAChR . Consistent with the action at the presynapse, it was shown that PKA facilitation of acetylcholine release is dependent on nerve endplate calcium concentration . Based on our observation of colocalization with synaptophysin at presynaptic vesicles, RIα may be the isotype that influences this release of neurotransmitter. We found that RIα occupies the same region as mitochondria in intercostal muscle. The presence of RIα in soleus muscle was shown with Western blots by Hoover and coworkers , but was not seen with immunofluorescence of tibialis anterior muscle [17, 19]. Reinitz and coworkers  provided evidence suggesting that RIα associates with membrane fractions in cardiac muscle when it is not associated with the catalytic subunit. The same may be true for intercostal muscle, in which case, association with the sarcolemma, mitochondria or other organelles is possible. Furthermore, RIα was shown to bind to cytochrome c oxidase subunit Vb (a mitochondrial inner membrane protein), which faces the matrix, in a cAMP-dependent manner . How RIα passes across the mitochondrial inner membrane is not known. Previously, we observed that D-AKAP1 mRNA and protein expressions are high in muscle . In situ hybridization showed consistency of D-AKAP1 and RIα staining in tongue muscle, indicating that in vitro association can indeed predict in situ interaction for these molecules. Consistent with the observed mitochondrial staining by anti-D-AKAP1, it was shown previously that one of the two alternative NH2-terminal motifs of this AKAP is necessary and sufficient for targeting to mitochondria . Interestingly, another AKAP governs voltage-dependent potentiation of L-type calcium channels through anchoring of PKA in transverse tubules . Because this potentiation is not dependent on RIIα, it is thought that RIα is capable of this AKAP-directed modulation of calcium channel activity . 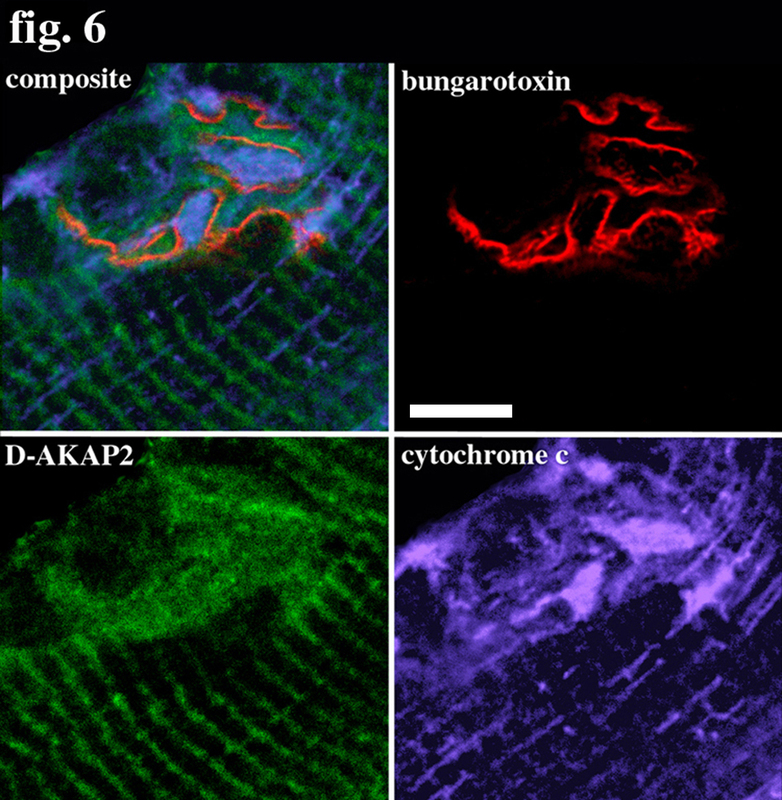 The labeling pattern of D-AKAP2 is diffuse in the NMJ, yet localized to the actin region in muscle. 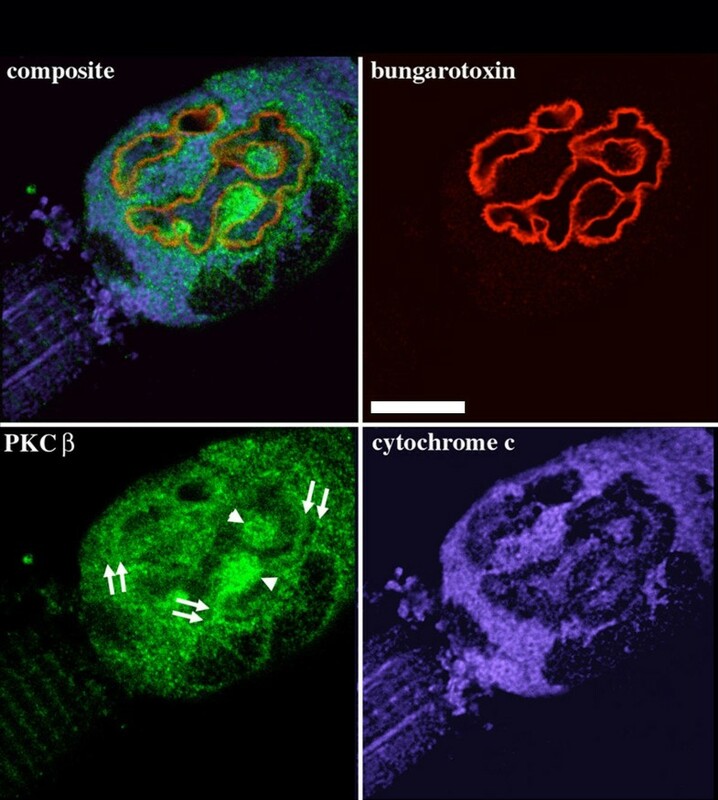 In our previous immunofluorescence work examining D-AKAP2 subcellular localization, the protein displayed a diffuse background in addition to mitochondrial staining . It was thought that the combination of specific and diffuse labeling indicated the presence of more than one pool of D-AKAP2 inside the cells examined. Whereas, D-AKAP1 appears to colocalize with mitochondria in muscle fibers, D-AKAP2 shows no such association. This observation is not surprising because it is not expected that their targets need to be in the same organelle or even subcellular region. Whether D-AKAP2 binds specifically to actin remains to be determined. RIIα localized quite well to mitochondria in both NMJ and muscle regions. PKA association with mitochondria has been well documented [38–42]. In mammalian sperm, it was found that nearly all RII-specific labeling was with mitochondria . Furthermore, in bovine heart, PKA activity was detected in the matrix or the matrix side of the mitochondrial inner membrane [44, 45]. However, the work of Halestrap and coworkers provided little evidence for intramitochondrial protein phosphorylation by PKA, but gave some evidence for outer membrane phosphorylation, both integral and loosely bound proteins [46–48]. The localization of RIIα to the postsynaptic region beyond the postsynaptic membrane is consistent with part of the immunostaining of NMJs in the soleus muscle , yet differs in part because there is no overlap with the bungarotoxin label; however, this is in agreement with another study . PKCβ colocalizes with gravin at the postsynaptic membrane where the gravin staining is strongest. PKC has been suggested to play a role in synapse stability and signal transduction at the NMJ . When calcium influx through the nAChR occurs, acetylcholine appears to activate PKC phosphorylation of this receptor [reviewed by ]. Phorbol ester activation of PKC causes loss of synapses and nAChR . Because the presynaptic PKCβ fluorescence band parallels the nAChR band (see fig. 7), it may be labeling the presynaptic membrane, consistent with reports of PKCβ localization to the presynaptic terminals of NMJs [22, 23]. PKCβ initially associates with the cytoskeleton . Phosphorylation at two places on the kinase core is required first to activate PKC, and second to release it from its cytoskeletal anchorage. Our immunofluorescence results may be the visualization of two pools of PKCβ. The observed bands may represent kinase anchored directly to the cytoskeleton, perhaps on the presynaptic side, where little gravin staining was found, or anchored to gravin, perhaps on the postsynaptic side. The more diffuse staining found in both pre- and postsynaptic regions may represent released, hence activated kinase. As with PKCβ, gravin was seen to be directed to the postsynaptic membrane. Strong labeling was also seen at the plasma membrane-cytoskeleton (see fig. 8), consistent with the report of Nauert and coworkers . Interestingly, a homology search of a database revealed a MARCKS homology actin-binding domain in gravin. In addition to acting as a scaffolding protein for kinases and phosphatases, gravin forms a dynamic complex with beta-adrenergic receptors . The same report also showed that the association of beta-adrenergic receptors with PKA could be blocked by the Ht31 peptide, which blocks AKAP-kinase binding. In addition to a PKC binding site, gravin contains a PKA binding site. Hence, the beta-adrenergic receptor may be tethered to PKA via gravin. PKC may bind to this anchoring protein through displacement of the pseudosubstrate, thus inhibiting the kinase activity, by analogy with a functionally similar scaffolding AKAP, AKAP79 . The distinctive labeling patterns of each of the seven kinase and anchoring antibodies investigated argues for the existence of microdomains of signaling pathways. It appears that several AKAPs may be in close proximity; yet, it still needs to be determined if waves of cAMP would turn on signals in a local or global way. Moreover, the signals that cells in tissues receive from the surrounding matrix may provide a different micro-environment of kinase anchoring from that of cultured cells. An example is the association of D-AKAP2 with mitochondria in cultured myocytes  that is not present in muscle tissue (fig. 6). Mouse anti-PKA RIα, mouse anti-PKA RIIβ, and mouse anti-PKA RIIα were purchased from Transduction Laboratories. Mouse anti-cytochrome c was purchased from PharMingen. Rabbit anti-PKC bII was purchased from Panvera. Rabbit anti-D-AKAP1 , rabbit anti-D-AKAP2 , and rabbit anti-gravin  were previously detailed. Rabbit anti-PKA RIα was prepared by synthesizing the N-terminal 18 residues of human RIα protein and conjugating this peptide (MESGSTAASEEARSLREC) to keyhole limpet haemocyanin (KLH) via the bifunctional reagent, m-maleimidobenzoyl-N-hydroxysuccinimide ester (MES). The KLH-RIα 18 mer was sent to Cocalico Biological Co. for polyclonal antibody production in rabbits using established procedures. Rabbit anti-lipoic acid cofactor was produced as described by Humphries and Szweda . Phalloidin-rhodamine binds to F-actin and was obtained from Molecular Probes. Fluorescein-labeled donkey anti-rabbit IgG and Cy5-labeled donkey anti-mouse IgG were purchased from Jackson ImmunoResearch. TRITC(rhodamine)-α-bungarotoxin was purchased from Molecular Probes, Inc.
For anti-gravin. Western blots were performed as described previously . For all other antibodies, rat intercostal muscle was excised and homogenized in 20 mM HEPES, pH 7.4, with 20 mM Nad, 5 mM EDTA/EGTA, 0.5% Triton X-100, ImM DTT and protease inhibitors on ice. The homogenate was centrifuged at 14,000 × g, for 30 min at 4°C; the soluble supernatant and insoluble pellet were each mixed with 4× SDS-PAGE sample buffer. These samples were separated by SDS-PAGE, electrophoretically transferred to polyvinylidene difluoride membrane, and blocked with 5% milk in PBS-T. Membranes were then probed with antibodies at ten-fold higher dilution than used for immunofluorescence for one hour, followed by one hour incubation with peroxidase conjugated secondary antibodies and detection with chemiluminescence. Western blots were repeated at least once to confirm results. Sprague-Dawley male rats weighing 100 g (about 4 weeks old) were anesthetized with the general anesthetic, nembutol. These rats were then whole-body, perfusion-fixed with 4% paraformaldehyde and 0.1% glutaraldehyde in a PBS solution, after perfusion with Ringers solution to clear the blood. Intercostal muscle was quickly extracted and immersion-fixed for 1 h on ice. Small strips of muscle were cut that were suitable for confocal microscopy. All of the following steps were performed on ice or at 4°C. Strips of intercostal muscle were rinsed in PBS with 0.4 mg/ml glycine (to quench the aldehydes) for 5 min, and permeabilized with blocking buffer for 20 min (0.2% triton X-100, 1% normal donkey serum, 1% cold-water fish gelatin and 1% BSA in PBS-glycine). Primary and secondary antibodies were diluted in working buffer (blocking buffer diluted 10× with PBS). The tissue was stained with a mixture of 2 primary antibodies – a kinase or AKAP, and a mitochondrial marker (either anti-cytochrome c or anti-lipoic acid cofactor) – overnight at 4°C. The tissue was washed extensively with working buffer after the overnight incubation. Secondary antibodies and bungarotoxin were added for 1 hour at 4°C in the dark. Afterwards, the tissue was again washed extensively with working buffer before mounting on glass slides and cover-slipped with gelvatol (anti-fade medium). The slides were stored in a refrigerator until imaged. A no-primary control was used to select conditions that blocked the nonspecific labeling of secondary antibodies. Laser-scanning confocal microscopy was performed as described previously . Experiments were repeated at least once to confirm the fluorescence patterns. Each fluorophore was recorded separately using narrow-band filters centered at 522 (fluorescein), 605 (rhodamine), and 680 nm (cy5). Z-series were recorded with each fluorophore with x,y pixel size of 0.05 microns and z-step of 0.18 microns. Each series comprised between 20 and 50 optical sections. Z-series were deblurred using a blind deconvolution algorithm from Autoquant. We thank the reviewers for helpful comments. This project is supported by National Institutes of Health Grant P01 DK54441. MHE is supported by the National Institutes of Health, National Center for Research Resources Grant RR 04050.